Israeli communications satellite. 7 Ku-band transponders. 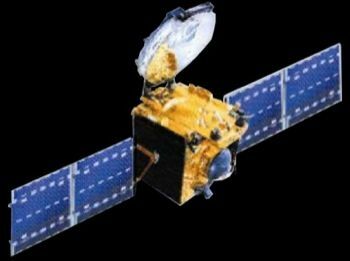 Israeli indigenous communications satellite program. Status: Operational 1996. First Launch: 1996-05-16. Last Launch: 2013-08-31. Number: 4 . Gross mass: 996 kg (2,195 lb). AMOS 2 Communication satellite built by IAI for Spacecom Ltd., Israel. Launched 2003. Used the AMOS Bus bus. 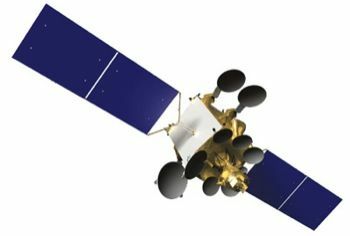 AMOS 4 Communication satellite built by IAI for Spacecom Ltd., Israel. Launched 2013. Used the AMOS-HP Bus bus. 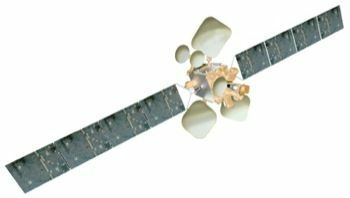 AMOS 6 Communication satellite built by IAI (prime); MDA (payload) for Spacecom Ltd., Israel. Launched 2016. Used the AMOS-HP Bus bus. 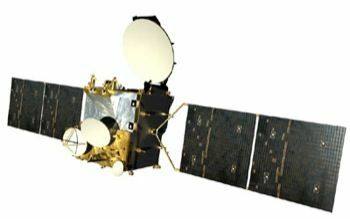 HK-Sat 1, 2 Communication satellite built by IAI for HKTSG. Used the AMOS-HP Bus bus. Family: Communications, Geosynchronous orbit. Country: Israel. Launch Vehicles: R-7, Soyuz-U, Ariane, Ariane 44L, Soyuz-FG, Zenit-3SLB. Launch Sites: Baikonur, Baikonur LC31, Kourou, Baikonur LC45/1, Kourou ELA2. Agency: IAI. Bibliography: 2, 4, 6, 6341, 12044, 12045, 12046. 1996 May 16 - . 01:56 GMT - . Launch Site: Kourou. Launch Complex: Kourou ELA2. LV Family: Ariane. Launch Vehicle: Ariane 44L. Amos 1 - . Mass: 996 kg (2,195 lb). Nation: Israel. Agency: IAI. Program: Amos. Class: Communications. Type: Military communications satellite. Spacecraft: Amos. USAF Sat Cat: 23865 . COSPAR: 1996-030B. Apogee: 35,800 km (22,200 mi). Perigee: 35,773 km (22,228 mi). Inclination: 0.00 deg. Period: 1,436.10 min. 7 Ku-band transponders Geostationary at 4.1W. Positioned in geosynchronous orbit at 4 deg W in 1996-1999 As of 3 September 2001 located at 4.04 deg W drifting at 0.001 deg W per day. As of 2007 Mar 9 located at 4.01W drifting at 0.004W degrees per day..
2003 December 27 - . 21:30 GMT - . Launch Site: Baikonur. Launch Complex: Baikonur LC31. LV Family: R-7. Launch Vehicle: Soyuz-FG. Amos 2 - . Mass: 996 kg (2,195 lb). Nation: Israel. Agency: Starsem. Program: Amos. Class: Communications. Type: Military communications satellite. Spacecraft: Amos. USAF Sat Cat: 28132 . COSPAR: 2003-059A. Apogee: 35,795 km (22,241 mi). Perigee: 35,780 km (22,230 mi). Inclination: 0.0600 deg. Period: 1,436.14 min. Intermediate orbit shown. 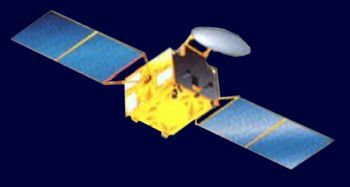 Fregat stage later placed Amos-2 in geostationary orbit. As of 2007 Mar 9 located at 4.00W drifting at 0.003W degrees per day..
2008 April 28 - . 05:00 GMT - . Launch Site: Baikonur. LV Family: Zenit. Launch Vehicle: Zenit-3SLB. Amos 3 - . Mass: 1,250 kg (2,750 lb). Nation: Israel. Agency: SIS. Program: Amos. Class: Communications. Type: Military communications satellite. Spacecraft: Amos. USAF Sat Cat: 32794 . COSPAR: 2008-022A. Apogee: 35,788 km (22,237 mi). Perigee: 35,784 km (22,235 mi). Inclination: 0.00 deg. Period: 1,436.10 min. Communications satellite. The Block DM stage made three burns to deliver the payload into geostationary orbit..
2013 August 31 - . 20:05 GMT - . Launch Site: Baikonur. Launch Complex: Baikonur LC45/1. LV Family: Zenit. Launch Vehicle: Zenit-3SLB. Amos 4 - . Mass: 4,260 kg (9,390 lb). Nation: Israel. Class: Communications. Type: Communications satellite. Spacecraft: Amos. USAF Sat Cat: 39237 . COSPAR: 2013-045A. Apogee: 35,796 km (22,242 mi). Perigee: 35,777 km (22,230 mi). Inclination: 0.0300 deg. Period: 1,436.09 min. Communications satellite for Spacecom company of Tel Aviv. Built by IAI-MBT with a mass much greater than previous AMOS satellites. Bus is probably around 5.0 x 2.5m with a span across the two solar arrays in the 12 to 15 meter range..